Mio Spirit 485 car sat nav features a 4.3-inch touchscreen and includes preloaded maps of UK and Ireland and comes with FREE 30 day latest map guarantee. Plus you can get real-time traffic information provided by the IQ routes feature and the TMC receiver. The Mio 485 includes predictive search which makes it easy to find your destination. In addition routes are learnt by the satnav so that preferences appear within the calculated route. It features 3D junction view and displays major road signs. The Mio Spirit 845 will alert you to speed camera locations FREE for the first 3 months. Mio Spirit 485 has been discontinued. 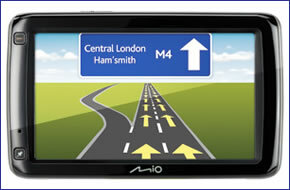 The Mio Spirit 485 is the entry-level satnav in the Mio Spirit series and features a 4.3-inch touchscreen and includes maps of UK and Ireland. Plus buy the Mio 485 from ActiveGPS and if there is a newer map version available within 30 days of purchase and registration with the manufacturer then you can download it for FREE. The IQ routes feature collates real-time information and feeds this back to your satnav so you can avoid congestion. Also you get real-time traffic information via the TMC provided with the Mio Spirit 485. When planning your route the Mio Spirit has a predictive search feature which predicts your destination, road name or point of interest. Over time the routes travelled are learnt so that your preferences appear within the calculated route. The time savings are then displayed on screen. At each junction the Mio Spirit 485 has a realistic 3D junction view and displays major road signs so you get the information about the road ahead in advance of the actual junction allowing you to get in the correct lane. The Mio Spirit 485 also comes preloaded with a speed camera location database free trial for a 3 month period. These speed camera locations are provided by RoadPilot and include all fixed speed cameras and average speed cameras. When you reach your destination you can search for parking locations within 1km avoiding the need to manually search for a parking space. The Mio Spirit 485 can also be used to explore on foot. Mio Spirit 485 has been designed to be Plug and Play, and as such can be transferred from vehicle to vehicle with ease by the user. The Mio Spirit 485 is powered with a 12-volt adaptor cable in-car (supplied) and attaches to your vehicles windscreen via the Mio Spirit 485 windscreen mounting bracket which is also included. Mio Spirit 485 is complete with the latest Navman TeleAtlas maps providing street level maps for Europe (23 countries): Andorra, Austria, Belgium, Denmark, Finland, France, Germany, Gibraltar, Great Britain, Italy, Ireland, Lichtenstein, Luxembourg, Malta, Monaco, The Netherlands, Norway, Portugal, San Marino, Spain, Sweden, Switzerland, Vatican.